Description: Golden Egg is the main editor of Yoshi's Island. 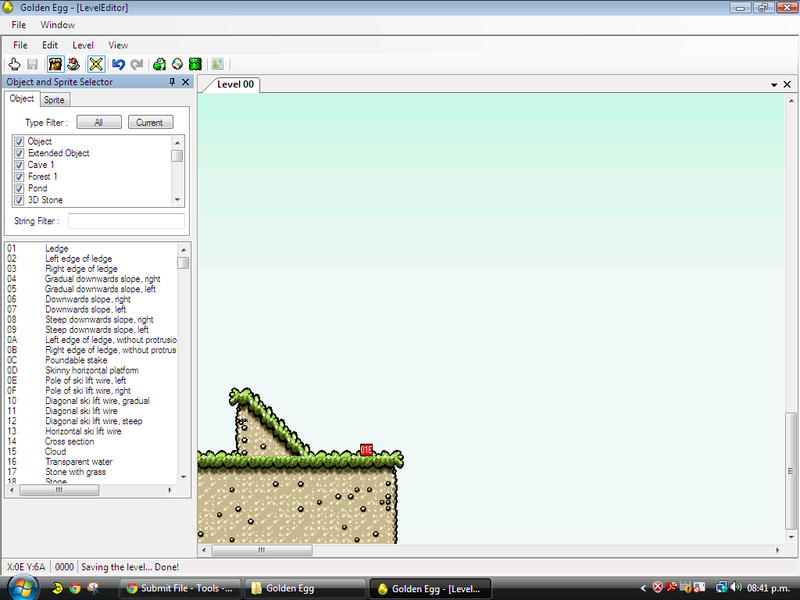 It allows object/sprite editing, Header Editor (tileset, music, etc. ), palette editor, screen exit editor and much more features. Note that this tools requires .NET Framework 4 and a Yoshi's Island 1.0 ROM. Note: this is a WIP tool, therefore, there may be bugs in the Editor. Attention non-Windows users: .NET Framework 4.0 now works enough in WINE that Golden Egg is functional. I've tested everything, including saving to ROM, and it all works. Unfortunately, there's not a lot this editor can do except objects, sprites and palettes within a level. You can't view backgrounds, edit entrances, or screen exits. Expect to have to consult this and the ROM map to finetune things to be the way you want them. Don't expect this to be the Lunar Magic of Yoshi's Island and you'll be fine.